A large abattoir need a pump for pumping waste out of a breaker and into some bins. The ‘waste’ consisted of lumps of fat, skin, intestines, the odd hoof and whatever else could find its way into the drain! One of the challenges was that the flow was inconsistent and the media would range from being very watery to being very thick. Pump & Valve sold a Roto progressive cavity pump complete with a hopper feed that has been ideal for the job. 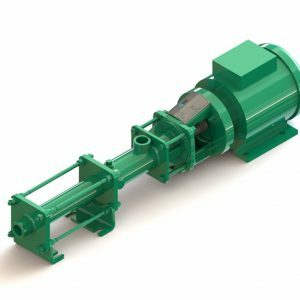 These pumps are perfectly happy pumping both thin and viscous liquids as well as liquids that contain solids. Interestingly enough it spent most of its life with just a trickle of water running through it (well under the rated flowrate) that was enough to lubricate the rotor and stator and prevent dry running. We don’t have a photo of the installation however please enjoy the video!